And Saints, and Saints and angels sing. I respect your right to disagree with me but this isn't a Christmas hymn! PS: Why do some people remove the "far as the curse was found" bit (thus saith wikipedia)? It's clearly in reference to how the earth was cursed for Adam's sake, to bring forth thistles and weeds... Can't see why that's objectionable. Good that you respect my right to disagree with you because I disagree with you. Christmas is not just about Christ's birth, rather it is about Christ's life in the same manner that your birthday celebration is not about the day you were born but rather your life from the time you were born to wherever your life is looking to take you. Good that you respect my right to disagree with you because I disagree with you. I was being a wee bit snarky there. Of course not, but all the rest of the hymns in our hymnal are. Seriously - go look at them - every one - Bethlehem, babe, star, birth, Mary, manger - every one of them! Seriously, don't take the little angry-face seriously - that bit was me being melodramatic. you are right... but Christmas is NOT about the second coming. Therefore it is most definitely NOT a Christmas song. If you disagree, if you think Joy to the world IS a Christmas song than that means you disagree with the The Church of Jesus Christ of Latter-day Saints and are an apostate. I have no idea whether Watts intended it that way, but particularly verse 3 is a future thing, not a past or current thing. I have actually studied this a bit, and he did. I may or may not post sources for this assertion eventually. I know. Hence my reply. I'm bummed you didn't catch it... I thought I was being clever. Hah! Which is a good thing that they included Joy to the World then! It would have been very remiss of them to only celebrate less than 1 year of the life of Jesus on his birthday! It is too about the Second Coming all the way to Final Judgment and onwards to forever and ever. 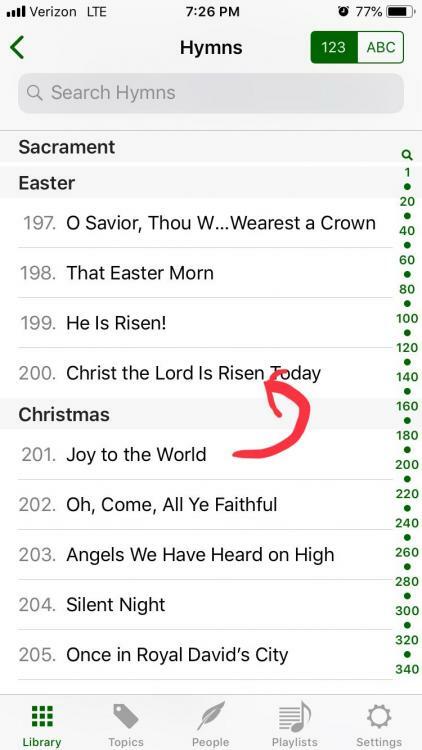 Obviously, the Church of Jesus Christ of Latter-day Saints agree with me because they put the song in the Christmas section. It was just a typo. It is suppose to be in the Easter section. And here I thought you'd think Easter is only until his resurrection and it would be apostate to include his Second Coming! That would be Christmas. Easter is pasteliculous. I find this so interesting, the lyrics for Joy to the World were written in 1719 by Isaac Watts and while some of the original song is in this version of it, it is quite different, so I guess you'd have to look to the LDS church to find out what they meant when they changed the lyrics and if they intended those changes to change the meaning of the original song, which was about the birth of Christ. I've sung this song so many times it really took me aback for a second trying to work out what was going on. For anyone who would like to see the differences the original lyrics are below with the original words that have been changed bolded. I think this is really the pivot point. Sentiments from the song reflect statements about the enunciation. And it was supposed to be based on Psalm 98. That was Watts' intention. Whatever Watts did or did not mean, the scriptures from which he based the lyrics are known and understood. The thing is that it was not an "eor". It was an "and". Many Jews believed that our Mortal Messiah was supposed to be the Millennial Messiah. So, many prophecies and ideas were interpreted in this way. But the prophecies had dual meanings. They pointed to the parallels of His condescension as well as His second coming. I believe the song talks to both. And Christians all over should be looking in both directs (past and future) when thinking of this song. There would be no Millennium without Easter. And there would be no Easter without Christmas. Again, I'd say this speaks to the idea that there is no Easter without Christmas. ...so I guess you'd have to look to the LDS church to find out what they meant when they changed the lyrics and if they intended those changes to change the meaning of the original song, which was about the birth of Christ. Yes, these changes were made in the 70s or 80s as I recall. Before then we had the other version in the hymnbook (I think???) Either way, I know I sang it the old way when I was a kid in Church. And I was thrown off by the new lyrics. Then in high school I was part of the school choir who sang the original version. And I was again thrown off. I can see that a few lyrics were changed because of doctrinal reasons. But I see some lines were changed because, quite honestly, the LDS changes align the lyrics better with the tune. The beats of the words more closely match the beat of the music. Maybe there was a doctrinal reason to change those as well. But I can't really see it. All I can say is me, @anatess2, and @Fether were having a lot of fun until you all started getting serious-like! Yup. That's what my family thinks of when they think of dad. "He's the serious one." NOT!!! Every party has a pooper. I'm it. Interesting. I know most of the song was about the second coming, but I guess I never thought about it and that all of the song was about the second coming. Thanks for sharing. I don't think it's the only one that refers to other events beyond his birth. True, but as Zil points out, none of the song Joy to the World is about Christ's birth. I never thought about it that way, but he is correct. Do you know that if you hit the Quote at the bottom of someone's post, it will open a new reply with their quote already in place? This is using the quote icon at the top of the new post window. The icon only enters "Quote" at the top. The Quote at the bottom of a person's post will enter the person's name, date, time, etc. Using the quote at the bottom also alerts the person you quoted that you addressed them. That will prompt them to come and react or reply or both. That doesn't mean they will. But all this information is helpful in the overall flow of conversation. The way you have it here, onlookers have no idea whom you're speaking to. Do you know that if you hit the Quote at the bottom of someone's post, it will open a new reply with their quote already in place? Yes; thanks. When I quote more than one person in a post or want to break up partial quotes, I usually do it the other way. Hopefully, it's not too confusing. To do a partial quote, you can select the portion you want to quote, and a popup will appear with a "Quote selection" option. I often go to the reply box, put in some text and hard returns, then go back up and start quoting selections... This is, of course, easier on a computer than on a phone. I wonder how this is intended to scan? I'm thinking "HAIL th'in-CAR-nate DE-i-TY-Y", but when I first read it, my mind tried to do, "HAIL the IN-car-NATE, um, Deity..."
OK. Again, just in case you don't know. The "+" sign next to "Quote" at the bottom is the multi-quote function. Give it a whirl. I think you'll find it easier to use than what you've been doing. 1) Click into the quoted post. 2) Place your cursor at the end of the line that you wish to address. As long as there is a carriage return both before and after the cursor, it will split the quote automatically. This means you may have to hit "Enter", backspace to the previous paragraph, then hit enter twice. You'll have to try it to see what I mean. 4) Then you can repeat this for every segment of the post you want to separate.